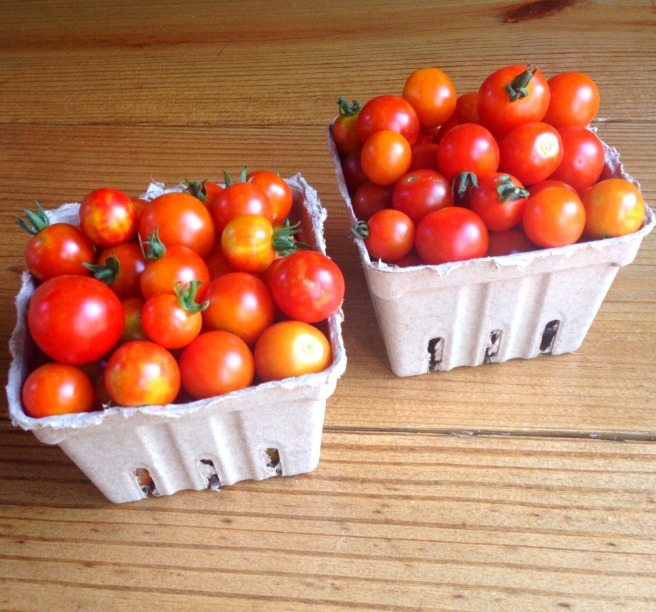 Cherry tomatoes are a great addition to your square foot garden. 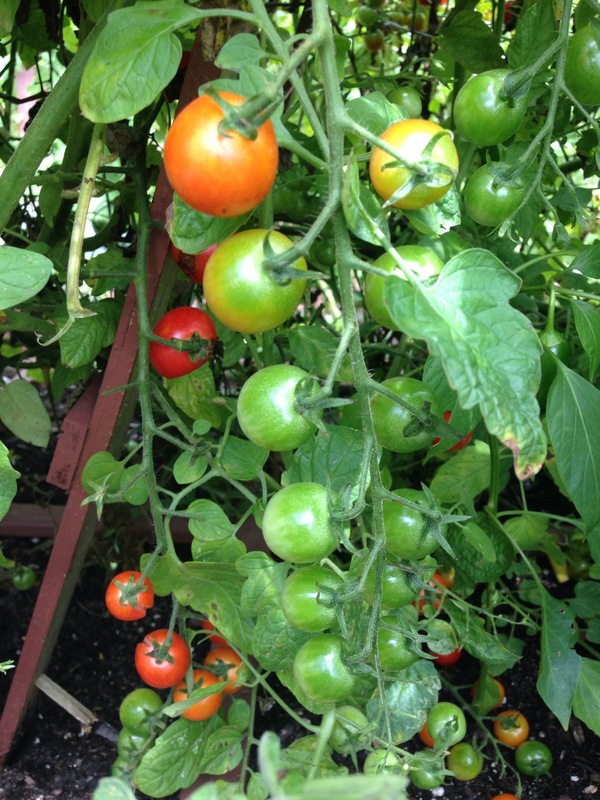 One plant produces AN ENORMOUS amount of plump and juicy tomatoes. Perfect for snacking and salads! Last year I planted four cherry tomato plants and we couldn’t pick them fast enough! It was more than plenty for us to enjoy and share with our friends! I really love growing cherry tomatoes, they are the perfect crop for the little ones to help harvest! If you have littles that love to help in the garden I highly recommend planting a couple cherry tomato plants! Cherry tomatoes are small round fruit and usually bare steady fruit all season long. Some varieties can reach up to ten feet tall. Yup, this is true! Last year when cleaning my garden I pulled one out and measured it from its roots to the top and it was TEN FEET LONG! Although they can reach this height, cherry tomatoes are a great container plant! I prefer the red cherry, large fruited variety. They are SO easy to grow and taste delicious! 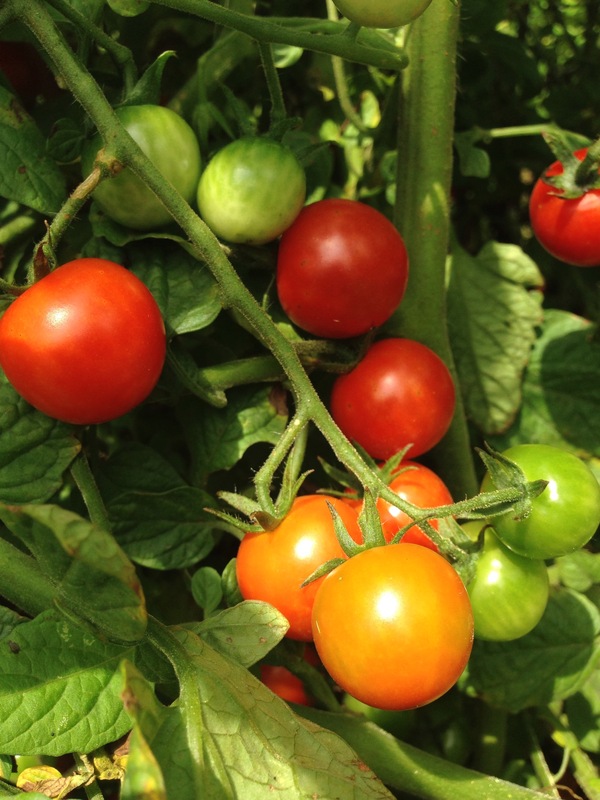 Cherry tomatoes requires full sun to produce, so plant your them where they will get 6-8 hours of sun plus. Cherry tomatoes only grow in the summer and are sensitive to cold weather. They take about 70-75 days to harvest so it is recommended to start your seeds indoors about 6 weeks before the last frost. Tomatoes cannot tolerate frost. It is recommended to wait until when the seedlings display 4-6 leaves and the last frost has passed to transplant outdoors. Of course if you are not going to start from seed your local farmer’s market or home and garden store will carry plants you can purchase to transplant into your garden. You can plant one transplant per square foot in your garden. Support your tomatoes with cages or stalks. You can buy cages at your local garden store. 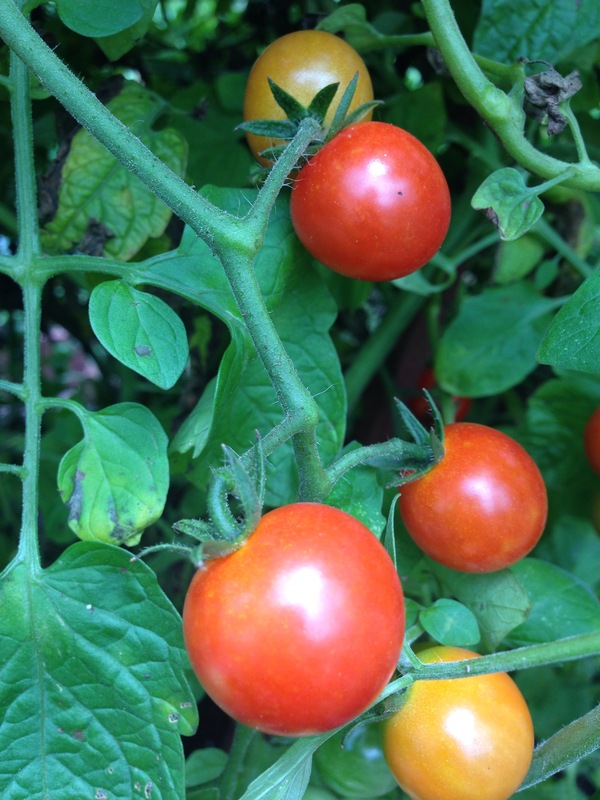 Cherry tomatoes are fairly simple to maintain. In the beginning you can pluck off the suckers or side branches which are the small branches that grow out from the main branch and a leaf. Some people refer to this as the”armpit” of the plant. Making the plant bushy, they take nutrients from the the main steam hence the reason it is called a sucker. By plucking these you are reassuring your main stem is getting all the nutrients. Once your plant has grown about one foot place a cage around the plant and continue to guide the branches thru the cage. Pluck lower leaves that turn yellow or brown. Cherry tomatoes are ready to be harvested when they are red glossy and firm. If you leave them on the stem to long they will get mushy, so check daily. When harvesting gently twist and pull from stem. I like to check my tomato plants every one to two days for hornworms for they can do some serious damage to a tomato plant.I remove and discard of them. Wait the extra day or two before harvesting your cherry tomatoes. Harvest when they are fully ripe and red! They are worth the wait, juicy and full of flavor! Cherry tomatoes are great for veggies trays, snacks, and salads but I also love to use my cherry tomatoes in the recipes below. If your out of ideas on how to use up all the those cherry tomatoes don’t let them go to waste check out my recipes!